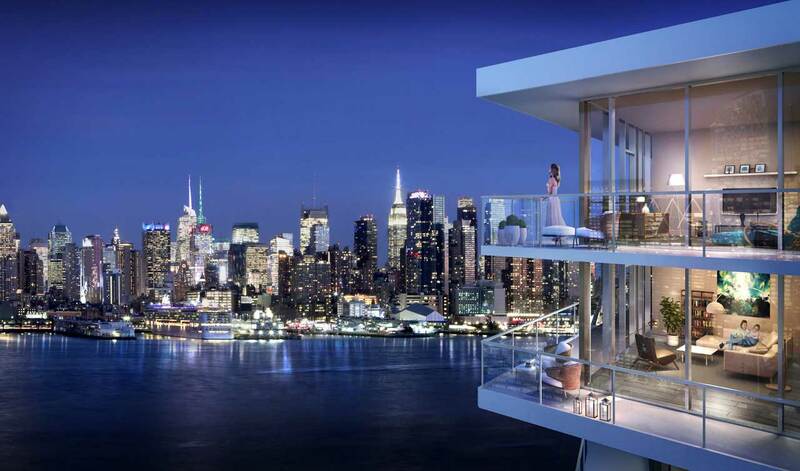 Two iconic waterfront condominium communities that have helped make Weehawken one of the hottest residential real estate markets in the state are nearing a close-out, the developer, Lennar, announced today. At Henley on Hudson, a collection of 201 luxury residences on the Hudson River waterfront, construction of the final building on the property is now complete. Immediate occupancy is available for the last remaining condominium homes. Just a half mile up the riverfront at Lennar’s 1200 Avenue at Port Imperial, the model homes that inspired so many buyers to choose the 103-home luxury waterfront community are now being sold themselves. Two furnished model homes recently sold and closed, leaving one three-bedroom furnished model and two staged homes available for tours. The popularity of the furnished models mirrors the overall popularity of the community, where a limited number of luxury residences remain available for sale. Henley on Hudson and 1200 Avenue at Port Imperial both benefit from Weehawken’s location opposite midtown Manhattan, its proximity to several forms of mass-transit, and its low-density approach to development which incorporates significant amounts of open space. The waterfront provides a quieter, more suburban residential setting than its urban counterparts in Hoboken and Jersey City, but also offers conveniences such as walkable shops, restaurants and recreation. The communities also benefit from Weehawken Township’s recent property tax reduction from 2.23% to 1.49%, giving the Township one of the lowest property tax rates in Hudson County. Both Henley on Hudson and 1200 Avenue at Port Imperial are situated in the Port Imperial section of Weehawken, a two-mile stretch of Hudson River waterfront featuring shops, restaurants, parks and a riverfront promenade. Residents enjoy a number of recreational pursuits, and more are on their way. A major expansion of Weehawken Recreational Park is underway that will include three outdoor pools, a seasonal ice skating rink, and a “Great Lawn” with New York City skyline views, among many other amenities. At Henley on Hudson, the remaining residences are priced between $875,000 and $2.5 million and feature one-, two- and three-bedroom floorplans ranging in size from 1,165 to 1,964 square feet of living space. The homes are single-level designs and many offer balconies or terraces to maximize the community’s dramatic views. All homes include numerous upscale features and appointments, as well as a home automation system that allows residents to control and automate lighting, temperature, entertainment and more. Homeowners at Henley on Hudson enjoy private amenities including a cardio fitness room, children’s playroom, lobby lounge and an outdoor garden terrace. In addition, residents will have access to the Club at Henley, a private 6,000 square-foot clubhouse with a club room, theater room, billiards and gaming lounge, state-of-the-art fitness center, Yoga/Pilates room, children’s play studio an outdoor patio with fire pit, and a resort-style infinity swimming pool. 1200 Avenue at Port Imperial is the second building in Lennar’s Avenue Collection, following the sell-out of 1000 Avenue at Port Imperial. It is an ultra-luxe collection of modern two- and three-bedroom condominium homes, currently priced between $1.399 million and $3.75 million for the remaining residences. Immediate occupancy is available. Residents of 1200 Avenue at Port Imperial enjoy a full suite of private, hotel-style comforts and services, including a grand salon lobby, library lounge, media screening room, children’s playroom, and state-of-the-art fitness center with men’s and women’s locker rooms with sauna and steam showers. On the 7th floor, the Skyline Social Room features a lounge space, catering kitchen, bar, multiple gathering areas with a fireplace, sound system and televisions; an internet lounge and more — all set against the spectacular backdrop of the New York City skyline. Outside, a dramatic third-floor landscaped plaza offers an expansive open-air amenity space that includes a sun shelf swimming pool, a catering bar, garden spaces with multiple seating areas and a fire pit with motorized shade trellis. Henley at Hudson and 1200 Avenue at Port Imperial are both ideally located for commuters. The Port Imperial Ferry Terminal is near both communities, offering convenient ferry access to Manhattan in about 10 minutes. NJ Transit’s Hudson-Bergen Light Rail connects Port Imperial to neighboring Hoboken and Jersey City, and the PATH system. For drivers, the Lincoln Tunnel and several major highways are all just minutes away. For more information on Henley on Hudson, visit www.HenleyonHudson.com. For more information on 1200 Avenue at Port Imperial, visit www.TheAvenueCollectionNJ.com. Both communities can also be reached by calling 201-210-0099.